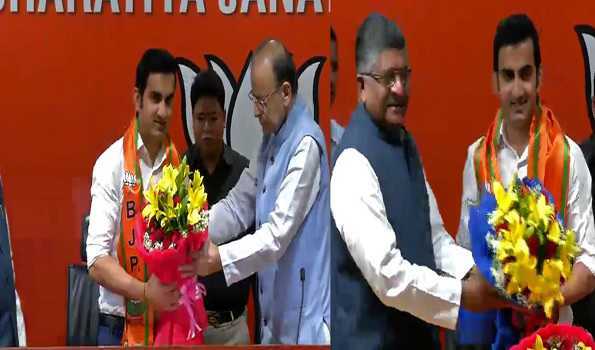 New Delhi: Former cricket star and left-handed opening legend Gautam Gambhir on Friday joined BJP in presence of Union Finance Minister Arun Jaitley and Law Minister Ravi Shankar Prasad. Welcoming him into the party fold, Mr Jaitley said Mr Gambhir's decision reflects the kind of expansion the saffron party has undergone in recent years. "The BJP will be a fabulous platform to work for the country....," said Mr Gambhir on the occasion. "I am impressed by the works of Prime Minister Narendra Modi," he said. Mr Gambhir is the only Indian and one of four international cricketers to have scored hundreds in five consecutive Test matches. He is also the only Indian batsman to have scored more than 300 runs in four consecutive Test series.